Trump joked that U.S. Ambassador to the U.N. Nikki Haley "she can easily be replaced." 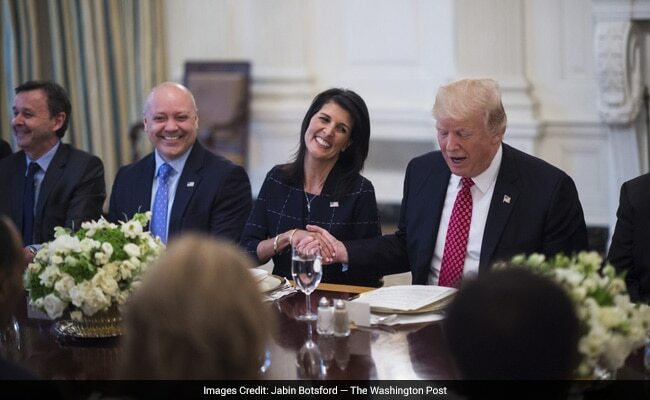 Donald Trump quickly clarified Nikki Haley is doing a "fantastic job"
If there's one member of President Donald Trump's team who has been a wild card early in his presidency, it's Nikki Haley. The United Nations ambassador has been a surprisingly strong presence, often making news about U.S. foreign policy in ways that seem somewhat, well, un-Trump. On Monday, Trump joked about firing her - quickly clarifying that she's doing a "fantastic job." "She's doing a good job. Now does everybody like Nikki?" Trump asked at a meeting of U.N. Security Council ambassadors and their spouses. "Otherwise she could easily be replaced. Right?" Trump added: "No, we won't do that. I promise. She's doing a fantastic job." "He has given me a lot of leeway to just say what I think and interpret what he thinks," Haley said of the president in an interview with CNN's Jamie Gangel. "I would never go rogue, because I'm very aware of who I work for." But Haley has used the UN to offer a hawkish veneer for Trump's less interventionist foreign policy. She has blasted Russia in the wake of the domestic attack in Syria by Bashar al-Assad, which motivated a US airstrike by Trump earlier this month. "I'm a strong voice by nature. I'm sometimes a bull in a china shop," she said. "And, you know, he allows me to do that." Haley, with no prior national security experience and once a vociferous Trump critic, has nevertheless emerged as an outspoken foreign policy figure defending Trump's worldview. And she's doing so from her perch as the US Ambassador to the United Nations, a narrow gig that has not always been at the vanguard of an administration's broader priorities. Despite Haley's comments, Trump is reputed to be wary of aides getting too much publicity and overshadowing him. Russia and Syria are perhaps the best examples of Haley's message getting out in front of the White House's. After the chemical weapons attack in Syria, Haley went to the United Nations on April 5 and held up photos of the children who were targeted. The next day, Trump himself said such images had affected him and changed his viewpoint, and he launched military strikes against the Syrian government the day after that. Haley has also been more forward when talking about regime change in Syria, even as Secretary of State Rex Tillerson has emphasized that defeating the Islamic State is Goal No. 1. And indeed, as Tillerson has sought to avoid the media, Haley seems to be filling the void and making news - sometimes with a more hawkish bent than the rest of the Trump administration. Vanity Fair has mused about whether Haley could find herself at odds with the State Department. All of which make Trump's joke Monday somewhat interesting. Of course, maybe it really is just a joke.